Yes, Carl Woolsey is out of the hospital. We should have noted that sooner. Stay well, Carl! 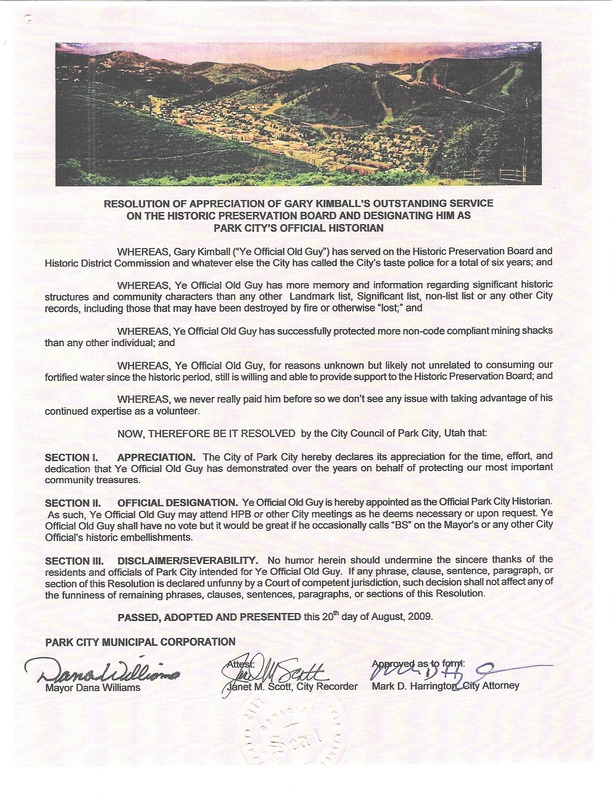 Gary Kimball has been appointed/annointed as Park City’s Official Old Guy–and in particular, as Park City’s Official Historian. The Council resolution reads, in part, “Whereas, Ye Official Old Guy has more memory and information regarding significant historic structures and community characters than any other Landmark list, Significant list, non-list list or any other City records…. Whereas, Ye Official Old Guy, for reasons unknown but likely not unrelated to consuming our fortified water since the historic period, is still willing and able to provide support to the Historic Preservation Board; and Whereas, we never really paid him before so we don’t see any issue with taking advantage of his continued expertise as a volunteer, NOW THEREFORE BE IT RESOLVED by the City Council of Park City, Utah that….Ye Official Old Guy is hereby appointed as the Official Park City Historian. I am still having a hard time believing that Jerry is gone. What a blow! I had the privilege of meeting Jerry when we ended up traveling in the same car for my first Westerners field trip a few years ago. He made me feel welcome then and I have enjoyed his friendship ever since. As we all know, Jerry was the kind of person who would help anyone out if he could. A few months ago, when he found out I was studying the Topaz internment camp, he gave me a file full of documents on the subject that he’d collected over the years. It meant a lot to me then, and means even more to me now. Thank you, Jerry. We’ll miss you. Jerry was a friend. I’m glad he got to share he childhood home of McGill, NV on our field trip. Although at the time I was in disagreement with him. His childhood memories of McGill conflicted with my memories of in-laws in McGill. I have now formed new memories of McGill and White Pine County. Thanks Jerry! You will be missed. agreeing wholeheartedly with Steve’s assessment. The Westerners and the whole realm of Utah journalism just won’t be the same without him. attended another UW meeting again. Jerry’s cantankerous-nous proved correct. 2006 Nebraska field trip. Jack Tykal and I took the reigns and ran the trip. you”, and as you all know, it was a trip for the books. renaissance man. The world got lonelier today. God bless you Dunton. You made me a better person. Please know and let others know in our Westerners’ group that I feel very sad about Jerry. We have lost a fine colleague, mentor and friend! Hi All: As one who has seen most of it in Utah Westerners, I would like to share my perspective on the death of our dear friend, Jerry Dunton. I compare the impact of his demise to that of Harold Schindler, almost exactly ten years ago. But Harold and Jerry were as different as night and day. Harold, a bit aloof , highly respected and a real history scholar, could take ten minutes just asking a question. Jerry, a fellow employee with Harold at the Salt Lake Tribune, didn’t become a Westerners until 1984, after pestering Harold for two years to invite him to a meeting. Jerry took a few years to make himself known. He never claimed to be a history scholar, but his active mind and curiosity eventually made him one of our most knowledgeable members, particularly about Western trails and Utah pioneers. He was active not only in Westerners, but in OCTA and in Lincoln Highway Association, where he assumed roles of leadership. In the Westerners he was elected to membership in the Board of Directors, then Secretary (when he posted monthly notices), then was made President. But it didn’t matter what his official role he had, Jerry was always helping, wherever help was needed. Over the years he planned and led many field trips, but even when he was not in charge, he was always there, calling ahead for reservations, loading water on the bus, or whatever. Nowhere was his talent and energy more apparent that in the recent 2009 field trip to the Great Basin, when he planned and directed the entire operation. Long before and during the trip he was forever worried about each detail and whether we could make everything on schedule. The success of his efforts were witnessed by the acclaim and kudos of those who participated. I only knew Jerry after he joined the Westerners, but I did see and talk with him frequently, as we were both attendees at a three times a week coffee group (all UW’s). No doubt he was devoted to his sons, Jim and Bob, to Bob’s son, and very much so to Jerry’s partner, Carolyn, who usually went on trips with him. Jerry, in fact, was looking forward to his annual September trip with Carolyn to Sonoma, , where they participate in the Wine Festival. For many years Jerry brought back bottles of “Two-Buck Chuck”, a cheap, but fairly good, wine for several of us to share. Alas, no more Two-Buck Chuck. Jerry’s sense of humor was contagious. He would often tell (sometime retell) stories about himself, and we would always laugh. Jerry would sometimes almost double up with laughter at someone jokes or stories. He also loved to talk about Western history, trails, commemoration events, or even mundane topics such as yard work. But one of our favorite subjects were computers and grown-men’s toys–also known as electronic gadgets. Schindler used to say that the word “unique” has no qualifications, and I suppose he was right. And yet, it seems that the word “unique” is not enough for Jerry. He is indeed irreplaceable. But what I have experienced in the Utah Westerners is the resilience and willingness of both old and new members to maintain our strong vitality far into the future. I am very happy to still belong to such a fine organization. I’m at OCTA, still trying to figure out how to express what the loss of Jerry means to me and all of us. I know my fellow OCTAonians miss him: I’ve had to let many know he was gone. You’ve all said it better than I could. But as Nate would say and say it all: Jerry was a mensch. I loved the guy. Some say if you want to know how irreplaceable you are, pull your hand out of a bucket of water. Well, the bucket just got smaller. Bud and Will, what a beautiful tribute. You certainly described the guy I knew. Jerry is both unforgettable and irreplaceable, and when I think of the loss of friends and associates like Jerry, I often think of the old George Jones song, “Who’s gonna fill their shoes?” Damn big shoes in this case. Thanks for sharing your thoughts. I was very saddened to hear of Jerry’s passing. He was a very good companion for years at the Westerners and a good friend. We will all miss him. Aw, nuts. I don’t cry much, but Jerry? Awful. RIP, my friend. You’re a great guy. Thank you for everything.